At LeafGuard by Midlands Home Solutions of Eastern Nebraska & Western Iowa, you can trust that you'll have the best roofing in no time! Contact us today for your free estimate. We provide quality roofing services, including roof repair, roof replacement and installation in Omaha, Lincoln, Council Bluffs, and the surrounding areas of Nebraska & Iowa! Schedule A FREE Roofing Services Estimate Today! Although rubber has been around for a long time, rubber roofing is fairly new. That's because it's taken a great deal of chemistry research to develop a thin rubber membrane with the durability and waterproof qualities required of roofing material. Rubber roofing is sometimes referred to as EPDM roofing. EPDM is an abbreviation for ethylene propylene diene monomer, the highly engineered compound used to manufacture most types of rubber roofing. Rubber roofing is used primarily on flat or low-slope roofs in both commercial and residential buildings. LeafGuard by Midlands Home Solutions is a full-service roofing contractor, specializing in everything from new roof installations, roof repairs and maintenance to total roof replacements. It doesn't matter what type of roofing system we are working with, we always ensure quality workmanship, excellent customer service and a long-lasting, durable roof over your head. 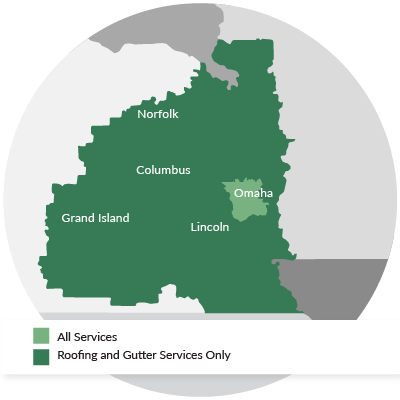 Our roofers work throughout the Eastern Nebraska & Western Iowa area, including Council Bluffs, Lincoln, Omaha, Bellevue, Sioux City, Kearney, Grand Island, Hastings, La Vista, Fremont, and many parts of Nebraska & Iowa. Call us at 1-844-807-6136 today to schedule an appointment for a roofing estimate. Get a FREE Roofing Materials Quote Now!